While the equipment certainly did not clean and dry the floors all in one pass, as autoscrubbers do today, these early machines were a very big advance in floorcare technology. 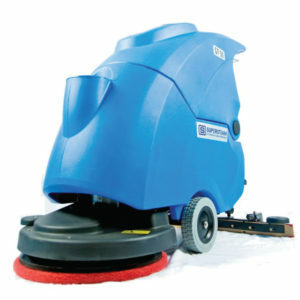 They used less water and less detergent and were overall more effective at cleaning floors than the old manual method. Floors also dried faster after cleaning. And, best of all, these machines improved worker productivity and morale tremendously.Today’s MachinesBy the 1970s, cleaning professionals had widely accepted these machines as a far more efficient and effective way to clean floors, and manufacturers had made significant advances in automatic scrubber technology. A moisture recovery system to vacuum up water/solution and soils into a recovery tank. Most of today’s machines now offer a fourth feature: A drive system that propels the autoscrubber forward, backward, left and right. When it comes to floor machines, greater mobility and maneuverability are typically high on the “want list” of floorcare technicians. However, greater mobility is not the only advance in automatic scrubber technology. Greener: This applies to the types of chemicals used, as well as chemical and water usage. Today’s machines also use less water and chemical, especially cylindrical brush systems. Safer: These machines are now safer for both the operator and others in the facility in which the machine is being used. Some of today’s automatic scrubbers have easy-access digital controls and greater visibility than older models, allowing users of varying heights to operate them, according to Doug Berjer, product manager for Tornado Industries, a manufacturer of automatic scrubbers. More machines are also fitted with solenoid technology to control water flow. In the past, water could continue to flow from these machines even when turned off, which was wasteful and increased the chances of a slip-and-fall accident. Now, water flows only when the machine is in use. Easier to service: A key advance in some floor machines is that they are now easier to service; operators can even handle many minor repair issues themselves. Manufactured with fewer parts: Berjer says that some machines have fewer mechanical parts now and that reducing the number of parts has also reduced the overall cost of ownership of some automatic scrubbers. For instance, “The forward motion traction drive system on some machines is in a sealed gear unit that [not only] has fewer parts, but requires no maintenance whatsoever,” Berjer explains. Another key improvement among automatic scrubbers in recent years (as well as among other types of floor machines, such as burnishers), is reduced size. Berjer adds that along with improved cleaning performance, the key reasons for this are enhanced worker productivity and safety.